This work introduces a novel family of CoII species having a curcuminoid (CCMoid) ligand, 9Accm, attached, namely [Co(9Accm)2(py)2] (1) and [Co(9Accm)2(2,2′-bpy)] (2), achieved in high yields by the use of a microwave reactor, and exhibiting two different arrangements for the 9Accm ligands, described as “cis”(2) and “trans”(1). The study of the similarities/differences of the magnetic, luminescent and surface behaviors of the two new species, 1 and 2, is the main objective of the present work. 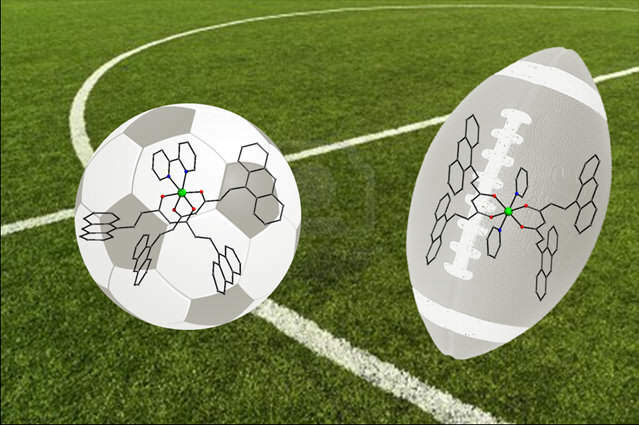 The determined single-crystal structures of both compounds are the only CoII-CCMoid structures described in the literature so far. Both compounds exhibit large positive D values, that of 1 (D = +74 cm−1) being three times larger than that of 2 (D = +24 cm−1), and behave as mononuclear Single-Molecule Magnets (SMMs) in the presence of an external magnetic field. Their similar structures but different anisotropy and SMM characteristics provide, for the first time, deep insight on the spin-orbital effects thanks to the use of CASSCF/NEVPT2 calculations implementing such contributions. Further magnetic studies were performed in solution by means of paramagnetic 1H NMR, where both compounds (1 and 2) are stable in CDCl3 and display high symmetry. Paramagnetic NMR appears to be a useful diagnostic tool for the identification of such molecules in solution, where the resonance values found for the methine group (–CH–) of 9Accm vary significantly depending on the cis or trans disposition of the ligands. Fluorescence studies show that both systems display chelation enhancement of quenching (CHEQ) with regard to the free ligand, while 1 and 2 display similar quantum yields. Deposition of 1–2 on HOPG and Si(100) surfaces using spin-coating was studied using AFM; UV photoemission experiments under the same conditions display 2 as the most robust system. The measured occupied density of states of 2 with UV photoemission is in excellent agreement with theoretical DFT calculations.